Today is World Cancer Day and I thought it was appropriate that I share a review on a book I just finished reading. When a man who has run 58 marathons and is actively involved in sports and sports management is told that he has a rare and incurable blood cancer, myeloma, he doesn’t take this news lying down! Pat Williams who serves as senior vice president of the NBA’s Orlando Magic and has in the past led the Philadelphia 76ers too to the finals is also a motivational speaker. When Pat was given his diagnosis of multiple myeloma , in 2011, he called on his faith and inner reserves and decided that his mantra would be ‘the mission is remission’. 1. A Positive Outlook – Pat outlines how he moved from denial to be realistically optimistic. Using quotes and examples from other cancer survivors, the author gave a lot of ways of how one can maintain a positive outlook post-diagnosis. 2. Keeping Fit – Although Pat was always fit with his marathon background, it was now difficult for him to exercise because myeloma causes the bones to be brittle. However, his advice to use diet, exercise based on doctors’ advice etc is priceless. I found this chapter could apply to anyone. 3. A Durable Faith – The author talks about his Christian faith helping him to be grateful and hopeful and how prayer helped him and others cancer patients to grow strong. 4. A Loving Family – Pat has a 18 children – five biological and fourteen adopted! He pulled his family together – wife, children, grandchildren and siblings to help him fight this. I liked some of the very valid points about forgiveness and healing of families, as well as the very useful tips for families of cancer sufferers. 6. A Supportive community – The author encourages those suffering from cancer to connect to organizations and groups that fight cancer and that fund-raise and attempt to share information and work with them. 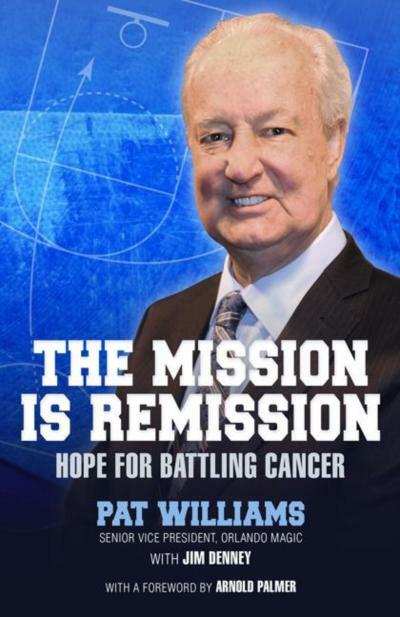 I like the way the book is written in many voices, as Pat pulled in his family, friends, colleagues, other cancer survivors to share their experiences of his fight against cancer and their own. I found the book informative and inspiring. PS: When you read my review in conjunction with this post from my blogger friend, Kathy Combs, you realize just how important Pat’s book is. Thanks for sharing, Kathy. I love the title. Mission is remission. And with his post one cannot help but realise that having a support system of any kind, be it friends or family is a must for sailing through any problem. Wow, that was a truly inspiring story. It’s true what they say…Cancer survivors are the biggest source of inspiration. They are fighters in the true sense of the word! Definitely need to put it on my reading list! I have to agree with this as a brain tumor survivor myself. The support of the community is so important. Corinne, this sounds like a very inspiring and informative book. I have had a minor scare in the past when there were multiple nodules detected in my thyroid gland about ten years ago. They are still there and I go for regular tests, FNAC, USG. What I like most in the points you shared about the book is what friends and family should not say. Support makes a huge difference and positive outlook too. Sounds like an inspirational book. People diagnosed with Cancer and their family needs lots f support from others. Keeping their up is the spirits up is the best medicine. Wow ! That was a good review…and that must be ONE book that would speak out to the world the intricacies of surviving Cancer. Would like to read it , for sure. I’m just reminded of some story I read in a book about a woman who imagined that white rabbits were eating the multiplying white blood cells in her body as she prayed. And she was cured of Cancer ! ( I don’t suggest that the white rabbits things actually happened. Just that her thoughts of the white rabbits, and faith helped her stay positive throughout the course of her illness. ) When she was cured, she had no doubt that her faith had cured her ! Looks like a very inspiring book. Have bookmarked it. This reminds me of a book I read. Shades of Life is written by a mother whose son had deteriorating kidney function. It also mentions about the pointers Pat shared in his book. SOunds phenomenal! Putting this on my to read list! I lost my dad to cancer and my wife her mom. ALways inspiring to hear stories of people who fight the battle and especially of those who win! Miracles still happen! Me and my wife have our own story to say in that regard for our coming new born! This sounds like such an inspirational read. I’ll put it on my wish list, Corinne! Blessings! Seems like an inspiring book. I liked how the 6 factor helped the man counter the illness. Of course, in times like these the family support is immensely required. Glad he has such a well weaved family. Cancer survivors sharing their own experiences are the biggest inspiration for cancer patients and their families. In fact, this applies to all diseases and disorders. The inspiration is even greater if the person happens to be a public figure. Betty Ford spoke about her battles with alcoholism and cancer. Closer home, I’m sure Yuvraj Singh’s cancer experience has given added will-power to many cancer patients and their families.